A large island just off Sentosa, Pulau Tekukor is an unused island that we seldom visit as special permission is required. Mei Lin obtained permission to hunt for giant clams and yesterday we made a rare visit there. Pulau Tekukor used to be an ammunition dump which was closed in the 1980s. 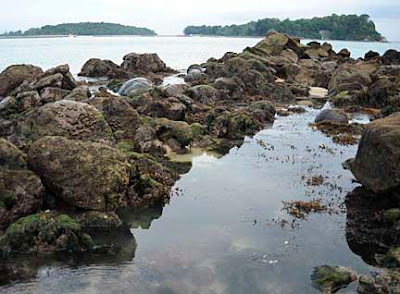 It is a large, long island and one side of the rocky cliffs remain undeveloped, fronting a long rocky intertidal. Reefs ring the island. According to Jeffrey Low's blog entry on the meanings of our islands' names, “tekukor” means turtle dove or spotted neck dove, so presumably Pulau Tekukor means “Turtle Dove Island” or “Island of Turtle Doves”. With Sentosa on one side and on the other side St. John's Island and Seringat-Kias/Lazarus Island. 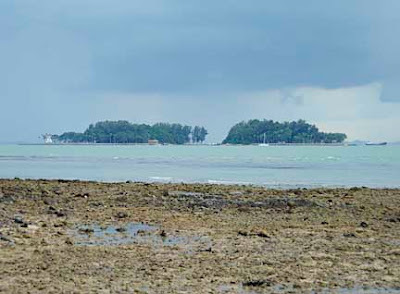 The Sisters Islands are also within sight of Pulau Tekukor. Fortunately, the weather developing in the background did not reach us. It is stressful for me to do a rarely visited shore as I try to document as much as I can. Every single thing is photographed. The rocky cliffs are cloaked in all kinds of plants. 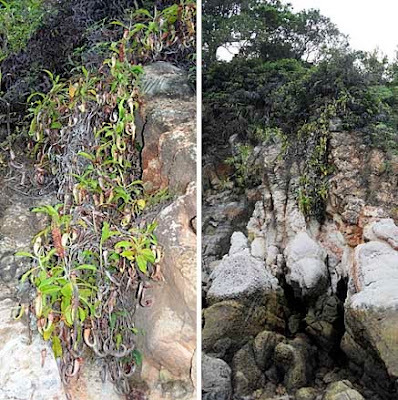 Mostly the usual coastal plants that we see on our other natural cliffs such as Sentosa and St. John's Island. But the pitcher plants here are particularly magnificent. They were flowering too. 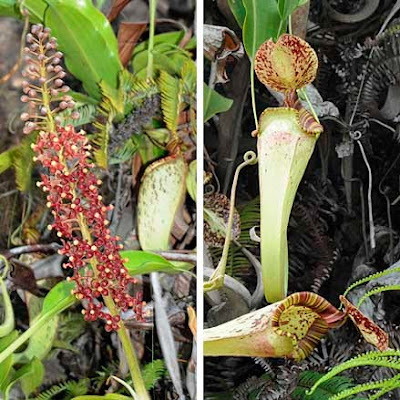 The large elegant pitchers with pretty markings suggests it is probably the Raffles' pitcher plant (Nepenthes rafflesiana). 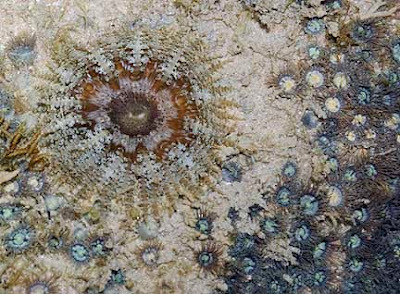 The most abundant animal on Pulau Tekukor are colonial anemones or zoanthids (Order Zoanthidea). The mid water zone was thickly carpeted with them. They are quite pretty especially when the polyps are expanded underwater. These Button zoanthids (Zoanthus sp.) come in an amazing variety of colours and patterns. There were also some pink ones which might be Zoanthus vietnamensis, and some patches of Sea mat zoanthids (Palythoa tuberculosa). There were also lots of Broad zoanthids (Palythoa mutuki). But I'm sure there are more kinds of zoanthids among the bewildering number of these creatures. The zoanthids, especially those in mounds, are sometimes mistaken for hard corals. 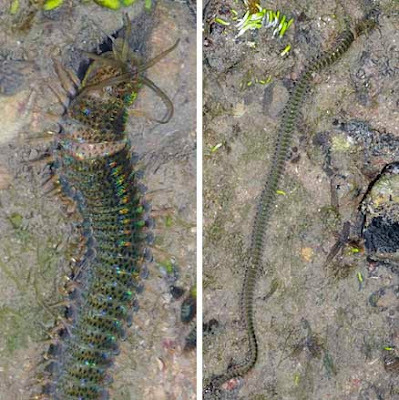 But if you take a closer look, you can see their thick body columns and they don't have a hard skeleton. This on the other hand is a hard coral, you can see the hard skeleton in the portions where the polyps have retracted. The polyps, however, do look very much like zoanthids. And this one is also a hard coral, Goniopora sp. although its hard skeleton is not very obvious. I didn't see many kinds of hard corals, and the colonies were few and far between. Some that I saw (from left): Branching montipora coral (Montipora sp. ), Anemone coral (Goniopora sp. ), Flowery disk coral (Turbinaria sp. 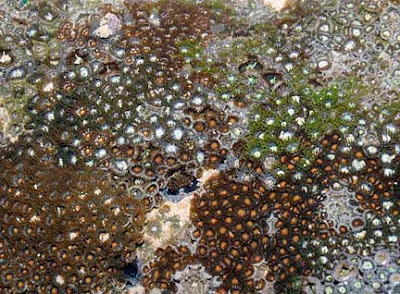 ), Pore coral (Porites sp. 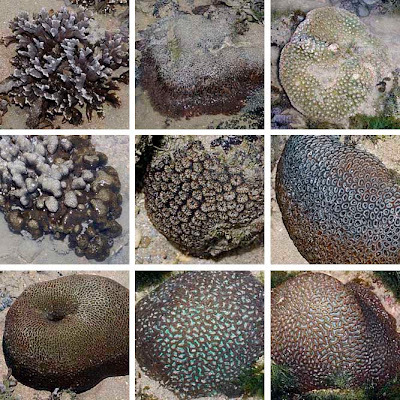 ), Zebra coral (Oulastera crispata), and various kinds of Favid corals (Family Faviidae). 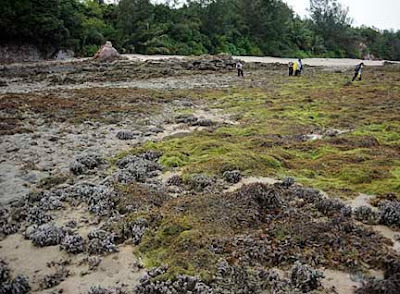 It was difficult to look at the reef edge where most of the hard corals would probably be. There was just too much sargassum and seaweeds there. There were also some leathery soft corals (Family Alcyoniidae). This one resembles a pinwheel. While there were those that look like discarded surgical gloves, and also a few clumps of flowery soft corals (Family Nephtheidae). Also very common on this shore were Frilly anemones (Phymanthus sp.). Almost all the different varieties we usually see were on the shore. I saw some Giant carpet anemones (Stichodactyla gigantea). And one Wriggly star anemone. There were also some Banded bead anemones on the higher shores. Other cnidarians included some feathery soft corals. 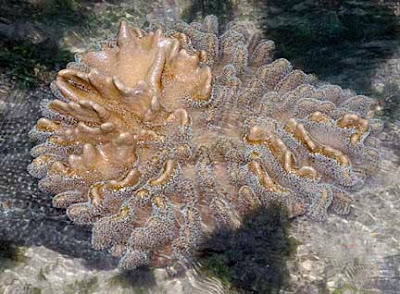 James saw some corallimorphs (Order Corallimorpharia), and Mei Lin saw a strange soft coral. There were quite a range of sponges on the shore, although they were not large or abundant (from left): Melted chocolate sponge (Chondrilla australiensis), Thick pink branching sponge (Callyspongia diffusa), Brown prickly branching sponge (Iricinia sp. ), Yellow pot sponge (Rhabdastrella globostellata), Smooth blue sponge (Lendenfeldia cf. chondrodes), Blue spatula sponge (Lamellodysidea herbacea), Yellow prickly branching sponge (Pseudoceratina purpurea), Golf ball sponge (Cinachyrella australiensis), and some unknown purple sponge. There are some patches of seagrasses on the shores. Larger stretches of Spoon seagrass (Halophila ovalis) and a small patch of Sickle seagrass (Thalassia hemprichii). And lots of different kinds of seaweeds. 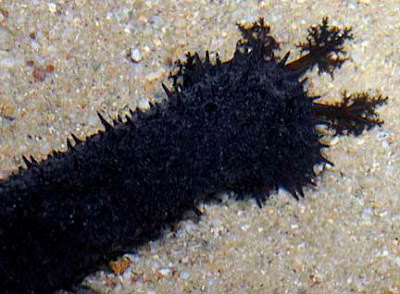 Another animal that astonished us with its abundance were the Black long sea cucumbers (Holothuria leucospilota). Here's Andy filming one of about ten animals in just a single small pool. These sea cucumber gathers edible bits from the sand surface using its long feeding tentacles that have bushy sticky tips. There were really small versions of the animal as well, something I've not seen before. 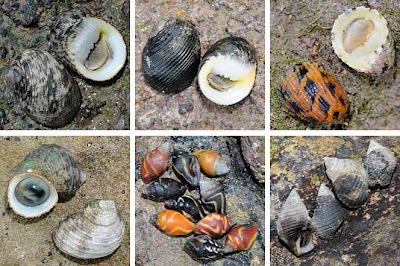 The rocky shore was teeming with all kinds of snails (clockwise from left): Two photos of Waved nerites (Nerita undata), one with mottled shells and another with black shells, and of Scaled nerites (Nerita histrio), Sulcate planaxis snails (Planaxis sulcata), Lightning dove snails (Pictocolumbella ocellata), Ribbed turban snails (Turbo intercostalis). And I saw one Giant top shell snail (Trochus niloticus). It was clinging onto a little stone covered with zoanthids when I turned it over. 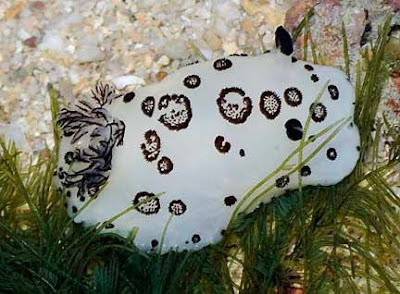 My only nudibranch encounter was with this Jorunna funebris which is commonly seen on many of our shores. There were, however, many Ornate leaf slugs (Elysia ornata) and this pair seem to be working on the next generation of slugs. With a bloom in Hairy green seaweed (Bryopsis sp. ), it's not surprising to see many of these little slugs (Placida dendritica). While Chay Hoon found the little slugs (Costasiella sp.) 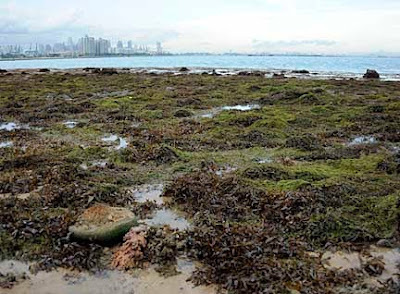 that live in the green fan seaweed (Avrainvillea sp.). Also in the seaweeds were this little red-nose shrimp (Periclimenes sp.) and a snapping shrimp (Family Alpheidae). I didn't see too many crabs. A few swimming crabs (Family Portunidae), and several Floral eggs crabs (Atergatis floridus) and one Red egg crab (Atergatis intergerrimus). 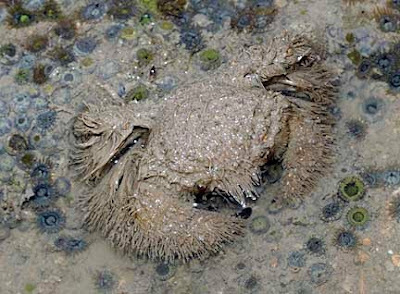 The Hairy crab (Family Pilumnidae) which is said to eat zoanthids were also out and about. As well as many little Marine spiders (Desis martensi). 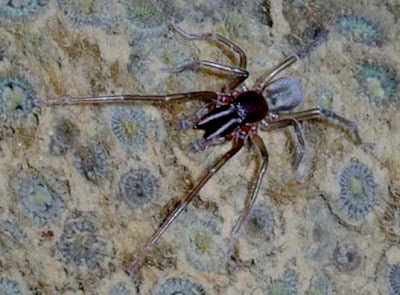 These spiders hide in crevices at high tide and comes out at low tide to feed. 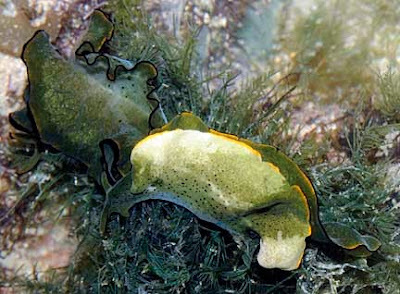 They are quite common on many of our shores. Fishes were hard to spot among all the seaweeds. 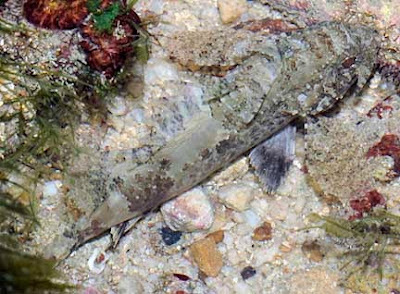 I saw flashes of filefishes (Family Monacanthidae) and this Longspined scorpionfish (Paracentropogon longispinis). 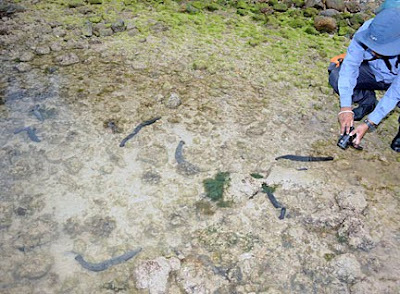 Worms can be exciting, especially the Giant reef worm (Eunice aphroditois). I haven't seen one for a while so it was nice to encounter one. With a face that only a mother could love, this very long and active worm is quite harmless if you don't touch it. 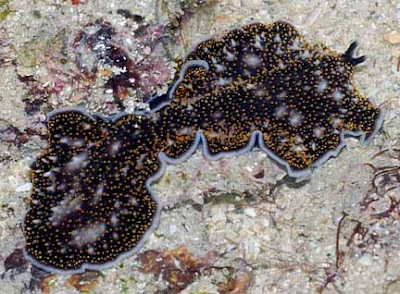 There were also several large Spotted black flatworms (Acanthazoon sp.). And I only saw two fanworms (Family Sabellidae). The strangest thing I saw was this. 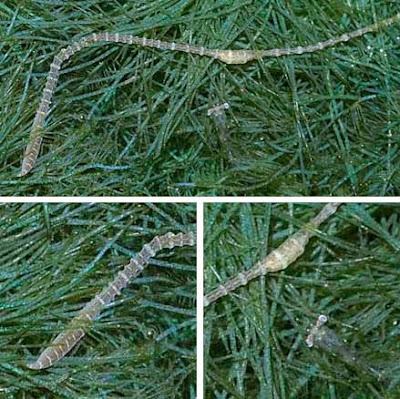 At first I thought it was a pipefish, but it suddenly shrank away. So perhaps it is a worm? Just as we were rushing home to catch the boat, we saw lots of land hermit crabs (Coenobita sp.)! It was really hard work documenting the shore as it was difficult to walk on the rocky and zoanthid covered shore (we tried not to step on any of them). The shore was rather disappointing in terms of variety of intertidal reef life. Which is strange as nearby shores such as St. John's and the Sisters Islands have a much richer variety. 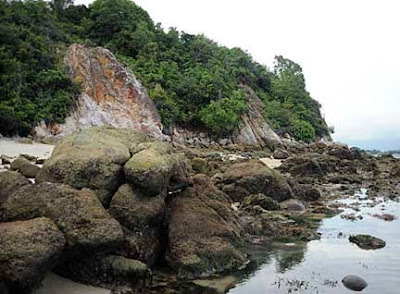 Still Pulau Tekukor is natural and special. And I hear the underwater reefs of Pulau Tekukor are very nice. Alas, we didn't find any live giant clams, although Mei Lin found the most number of dead clam shells here. This is intriguing. 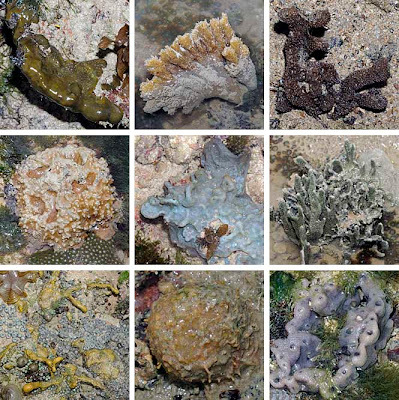 Pulau Tekukor on Coral Reefs of Singapore: some basic information. 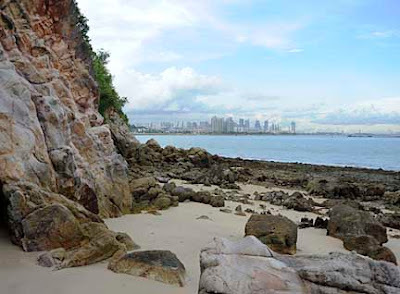 Monkey Island a project to relocate macaques to the island that did not materialise. Dolphins spotted off Pulau Tekukor on the wonderful creations blog. Singapore island names: what they mean and how they were derived on the Compressed Air Junkie blog. Land of the Clam Graveyard from Psychedelic Nature. Pulau Tekukor from Singapore Nature.